The World's Only Genuine Pi Water. Manufacturer WONYONG. Vital Organic Water. Experience Miraculous Vital Organic Water™ Drops(High Energy V.O.W.)! A Few drops of "V.O.W. Concentrate" into water makes Vital Organic Water™. From natural ingredients, it's "V.O.W. Concentrate" you can add to any drink. Directions for use : Use after dilution. Drink diluted Vital Organic Water™. Directly using(Drink a few drops directly without dilution) is also good. 1bottle(15ml ; 0.52oz.) : 350drops. Add(Use) 5~6drops(per one cup) per one time(a dose), The usage of 70times per bottle. Generally, 20drops per day. Refer the instructions inside. It is functional water that is induced from the excited(highly energized) state of infinitesimal amount of iron(ferric-ferrous salts) ions, found from living organisms, which enhances immunity and natural healing ability to improve the health. Squeeze a few drops of V.O.W. Concentrate into a cup of drinking water. Please beware of counterfeits(imitations of salty taste, etc.) from Japan & U.S.A. In the genuine pi-water concentrate technology by WONYONG, the salty ingredient is not contain at all. What is the WonYong Pi(π)-Water[Vital Organic Water™(V.O.W.)] ? 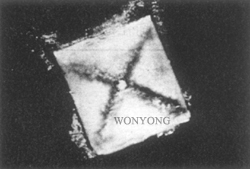 The question on the blooming phenomenon of plant was the initial origin of WonYong Pi(π)-Water, which led to the discovery of the substance conducting a important action other than the hormone (florigen) during the research course of flower bud differentiation. It was the vital water of plant itself. This is the water induced by memorized transcription of vital energy from infinitesimal amount of the iron ion [ferric-ferrous salts lipid complex]. This is called as "WonYong Pi(π)-Water", and "Pi(π)" stands for the activation, meaning the life, to express it in a easier way. All the substance in the natural world will destroy organizational structure through being oxidized, spoiled and resolved, and therefore, the new substance will be established. Like this, it is the ferric-ferrous salts lipid complex which suppresses the oxidizing, resolving and destroying power, and induces the activation of the living body. 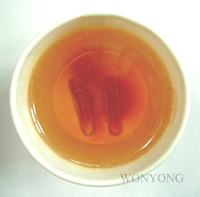 And, it is the "WonYong Pi(π)-Water" which makes the ferric-ferrous salts lipid complex acted in the normal water by extracting it in a special method. Through verification, it was proved that this water had been playing a very important role in the living body. WonYong Pi(π)-Water which was discovered from the organic water of plant is very close to the original water which was the beginning of creating life after the birth of the earth. The activated water creating life is being created in all the living creatures at present also, and it becomes the source of vitality such as immunization capability, etc. 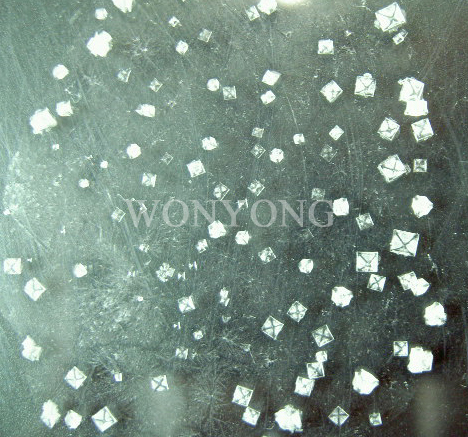 It is the WonYong Pi(π)-Water created by applying(memorization) living body materials through using special method extracting infinitesimal amount of the ferric ferrous salt discovered at the organic water. WonYong Pi(π)-Water is the high-energized water promoting activation of the living body and regulating the balance of Yin and Yang. It means the water infinitely close to the organic water, and the water with highly activated vital energy. ③ It records the information on the biological activity, and conducts the action to activate biological activity in the living body (strengthening of immunization capability). * Anti-oxidation effects of V.O.W. drops. Ultra Strong Antioxidant - V.O.W. drops is far superior effective than general strong antioxidant materials. WonYong Pi(π)-Water is vital water that has the strongest antioxidant characteristics. Modern scientific and medical findings to date indicate that the primary culprits to our bodies getting sick and aging are harmful agents called oxidants. Active oxygen is believed to be related to 90% of human diseases. Thus, active oxygen is known as a main culprit for most human diseases (diabetes, atopy skin infections, stomach ulcers, duodenum ulcers, chronic constipation, chronic diarrhea, liver disease, gout, high blood pressure, low blood pressure, hardening of arteries, kidney disease, aging, etc.) Our bodies are constantly attacked by these same oxidants, and our organic cells and genes (DNA, RNA) get damaged by the oxidation process. Large amounts of oxidized debris/wastes from oxidized cells circulate throughout the body through the blood vessels, causing diseases and resulting in aging. Harmful oxygen reacts with fatty materials in our body to make overly oxidized fatty substances, and these oxygen molecules and overly oxidized fatty substances damage cells and lymphcytes, destroy red blood cells, and coagulate blood platelets, causing all kinds of ailments, ranging from strokes, hardening of the arteries, myocardial infarction and cerebral vessel problems to accelerated aging, diabetes, atopy skin infections, cataract, liver cancer and other cancers. 90 % of cells are comprised of water, and strong oxidation reactions take place when the cells are filled with water with active oxidants. Our body's cells are constantly attacked and damaged by oxidant agents (active oxygen). One's health cannot be restored by delayed or improper treatments alone, when the primary cause is ignored. In other words, by drinking a plentiful amount of our WonYong Pi-Water, one can protect cells from oxidation stress and maintain his or her health. These special effects are only possible by original(genuine) WonYong Pi(π)-Water. All waters other than the original WonYong π-water can not actually demonstrate these effects at all. * Detoxification action of V.O.W. drops. Ultra Strong Detoxicant - V.O.W. Drops is far superior effective than general strong detoxicant materials. - It is excellent effective to liver trouble & kidney trouble & toxin relation diseases. 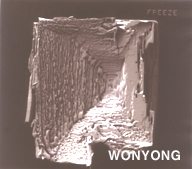 WonYong Pi(π)-Water conducts the action inhibiting harmful toxin ion(controls of oxidation-reduction reaction). 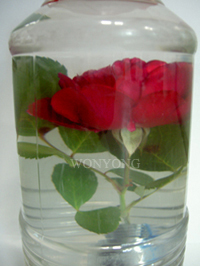 WonYong Pi(π)-Water makes it unharmful by inhibiting the action of harmful substance. - Suppression of toxicity by means of suppressing power against ionization of harmful toxin ion(suppression against action of harmful toxin ion). 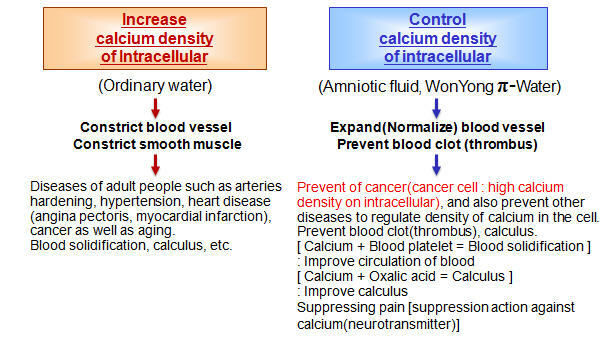 WonYong Pi(π)-Water not only eliminates harmful activated oxygen but also has the suppressing power against ionization of harmful toxin ion which inhibits(neutralizes) the action of harmful toxin ion by surrounding harmful toxin ion, if there's any harmful toxin ion conducting bad action(unbalance). 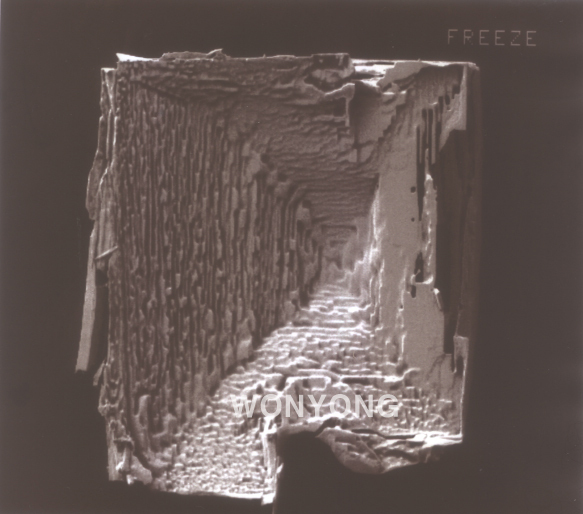 As time goes by, while all the general water will be contaminated(ionization, deterioration, oxidation, spoiling, toxic action) due to the ionization, WonYong Pi(π)-Water prevents from being contaminated by suppressing the action of ionized harmful substance owing to its capability of neutralization(control oxidation reduction reaction ; keeping balance of living body). It conducts the action inhibiting toxicity as well as harmful activated oxygen by utilizing strong suppressing power against ionization of harmful toxin ion(detoxification action). The fact that the toxic substance acts as poison means that the power of chemical combination of harmful substance molecule with other molecules is strong due to the ionization and unstability by being dissolved in the water and reacting with water. It establishes the condition of suppressing generation of excessively activated oxygen, and that of inhibiting display of toxicity by the poison through surrounding harmful ions utilizing its habit of surrounding them when it meet with them. 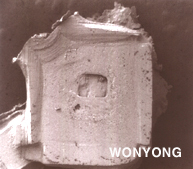 This is the very reason why WonYong Pi(π)-Water keeps living creatures from various types of toxic substance. - Saltwater fish and freshwater fish both live together in WonYong Pi(π)-Water. 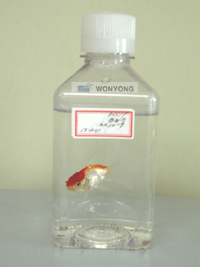 - Fish living in the potassium cyanide: Prepare general water and WonYong Pi(π)-Water, and put several tens ppm of potassium cyanide into them respectively. After that, if 10 heads of fishes were put into each water respectively, all the cyprinodonts at the testing tool in general water with potassium cyanide were killed in a few minutes, while those in Pi(π)-Water with potassium cyanide were swimming healthily without being killed. Provided that the enough ferric salts were put into the water in this experiment. - Experiment using acetic acid copper(test of ionization by means of copper and acetic acid): Put copper powder in the distilled water. It will become acetic acid copper if you add a drop of acetic acid. The color of copper will be changed into blue. But, the water will not be changed into blue, if you test the same after replacing distilled water with WonYong Pi(π)-Water. That is, it shows that the acetic acid copper was not generated because ion dissociation was not occurred. * Calcium antagonism(Action of calcium antagonist) of V.O.W. drops(preserves the characteristics of calcium). Easily speaking, Calcium antagoinsm : Promote blood circulation[Prevent blood vessel constriction & smooth muscle constriction, Prevent blood clot(thrombus), Prevent blood solidification], Protect heart and cardiovascular system, Prevent calculus, Suppressing pain[suppression action against calcium(neurotransmitter)], Prevent premature birth, etc. Prevent of cancer(cancer cell : high calcium density on intracellular), and also prevent other diseases to regulate density of calcium in the cell. [ Calcium antagonists ] : Medicine for “Diseases by blood vessel” and “Cardiovascular diseases”. Harmful materials -> Constrict blood vessel, etc. -> Cause much of diseases. Prevent blood clot(thrombus). etc. -> Promote blood circulation. V.O.W. drops suppresses attack of Calcium and, control calcium density. The calcium density will not be increased if you add a small amount of V.O.W. drops. Because V.O.W. drops is suppressing the invasion of calcium into the cell. Though it is absolutely essential to have very small amount of calcium in the cell, its density must be preserved constantly. Though calcium in the cell is essential in the activation of the cell, it will injure or kill the cell in opposition if calcium invades into the cell from the blood and is increased in amount. Increasing calcium density act on blood vessel constriction & smooth muscle constriction. If this thing continues, it will be the source of the diseases of adult people such as arteries hardening, hypertension, heart disease(angina pectoris, myocardial infarction), cancer as well as aging. Also, increase calcium density of intracellular acts on oxytocic(uterus constriction). It causes premature birth. Amniotic fluid also suppresses smooth muscle constriction of uterus, and prevents premature birth like V.O.W. drops. It may be considered as the very important issue in the prevention of cancer(cancer cell : high calcium density ) to regulate density of calcium in the cell like V.O.W. drops. V.O.W. drops have control of calcium coming to the intracellular. Moreover, it is considered that the fact of suppressing pain through V.O.W. drops is owing to this suppression action against calcium(neurotransmitter). V.O.W. drops prevent thrombus(blood clots ; Improve blood circulation ultra strongly) extremely strong and calculus too. The suppression of blood solidification is owing to the regulating action of calcium also. V.O.W. drops improve circulation of the blood. The combination of oxalic acid and calcium forms the calculus. If you add V.O.W. drops at calcium phosphate & calcium oxalate making calculus, the calculus will not be established. It has the action of inhibiting calculus. The reason why V.O.W. drops makes blood pressure lowered(normalized) also shows that it makes circulation better by regulating calcium action within the body and expanding(normalizing) blood vessel. Among 1~2 kg of calcium existing in our body, 99% of it is existing in the bone, and the remaining 1% is existing in the blood, extracellular fluid and cellular fluid, etc. The action of Vital Organic Water™ is greatly involved in the action of this 1% calcium. The action of calcium, even though it is in the infinitesimal amount(1%), plays a very important role involving in the stabilization of cell membrane, transmission of signal in the cell, secretion of nerves transmitting substance, regulation of various hormone secretion, blood solidification, and contraction of heart muscles, skeletal muscles and smooth muscles because the constant amount of calcium is required always. Though constant amount of calcium is required always, the lack of calcium caused by the unbalance between supply and demand will result in acquiring necessary calcium by melting its own bone because the required quantity of calcium in the body is changing always. Generally, there may be excessive calcium absorbed from bone temporarily, though the calcium taking in from the meal is not absorbed more than the amount needed. The calcium in the bone will be diminished because the calcium stored in the bone is turned into the blood. The calcium coming out of our bone should go somewhere, upon completion of its role in the blood stream. This(harmful villain calcium coming out from bone) promotes the diseases of adult people such as arteries hardening, hypertension, etc. by attaching to the blood vessel wall or human anatomy. Or, it may injure the cell or make cancer by invading into the cell at its will. The protection against attack of these excessive harmful villain calcium to the cell etc is one of the actions of WonYong Pi(π)-Water. * Improve blood condition(Protect heart and cardiovascular system). VOW drops improve circulation of the blood & condition of blood vessel, and make clean & fresh blood(purification & revitalization of the blood), and activate blood-forming organ(cells), and increase bloodstream in the brain, effective heart and cardiovascular health, etc. 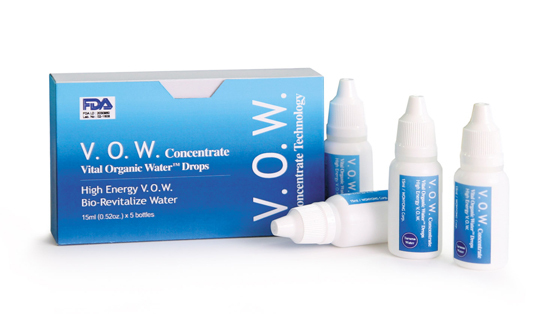 VOW drops enhances human body's immune system extremely. It also strengthen stamina. * Memorize and transfer ability of LIFE informations by V.O.W. drops. Record the life(living activity) information, and activates the life process in a living organism. One of the most miraculous character of V.O.W. is its memory power. It records the information on the biological activity, and conducts the action to activate biological activity in the living body. Organic water makes our bodies alive, it is because of the special structure of water, for instance, small ting seeds grow to plants, blosome flowers, ripen fruits. All these phenomena depends on the DNA information of the plants. And this DNA information changes to the water's nature. This is because organic water controls the memory of the information and transaction. V.O.Water memorize and transfer specific data on physiological conditions. In addition, such memorization and transfer of data occur only when such acts are beneficial to us. V.O.Water keep such life informations and transfer anothers by infinitesimal amount of ferric-ferrous salts. It apply to Pi(π)-Vaccine Technology, etc. * The memory on the substance by V.O.W. drops. Composition of protein - we may observe that the same protein as before is formed, if we make simple ferric salt by eliminating protein from the protein solution containing a certain kind of ferric salt, and add amino acid to that aqueous solution. This fact is the proof that the information on the protein is being maintained in that ferric salt. Prevent from rotting & inflammation, Keeping freshness our cellular tissue & blood & organs & body. V.O.W. drops is far superior effective than "medicine for intestinal disorders(Probiotic, Lactobacillus, etc.)". - Prevent abnormal rotting in the intestines(bowels). - Suppress propagation of bacteria. 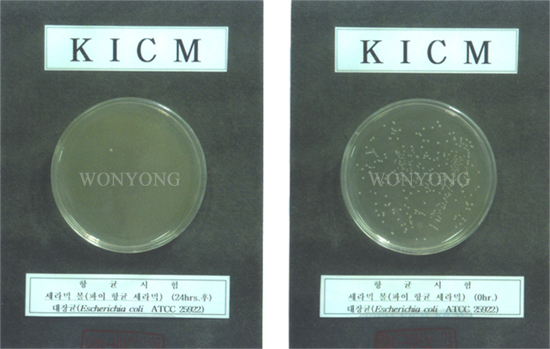 - Harmful bacteria are suppressed, and good bacteria are reproduced. - The propagation of bacteria will be suppressed. It has the action suppressing propagation of bacteria against the fungi such as O-157, MRSA, etc. like the amniotic fluid. It is the water with very strong activating power. 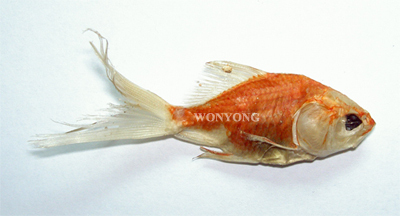 The freshwater fish which has lived and after died in WonYong Pi-Water does not rot but becomes a mummy whereas ordinary water impossible with the phenomena. * Explain the picture: Fish mummy after take out from inside the diluted V.O.Water. Of course, fish also become a mummy even if, it is being inside the diluted V.O.Water. - Flower keep beautiful healthy state in the water(V.O.Water) whereas ordinary water impossible. WonYong Pi(π)-Water have not only neutral pH 7.0 but also strongest anti-oxidation effect. It is the water having special capability with two features at once whereas ordinary water cannot. * V.O.W. drops has a high vital energy. - If you take a picture of finger by Kirlian camera after drinking WonYong Pi(π)-Water, you may identify radiation of aura. It has a excellent protecting capability of living body(antibody). (It is the water with saltatorially high wave motion of living body and internal energy). * The crystal of V.O.W. drops treatment salt has the shape as a pyramid. The crystal of common salt is the shape as a hexahedron. * V.O.W. drops has the small water molecule structure. 1. Strong penetration capability. 2. Smooth and delicious water. 3. No burden even if drink much. 4. Quick boiling owing to the high degree of heat conduction. 5. Good for your health. * V.O.W. drops contains abundance oxygen. 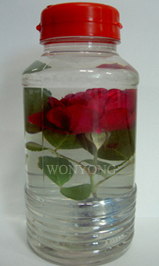 WonYong Pi(π)-Water have not only much oxygen but also anti-oxidation effect. 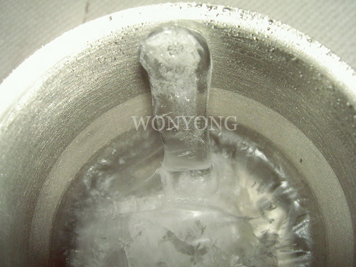 * Icicle phenomenon - It was the thing formed during the freezing period of V.O.W. drops because the icicle formed on the surface of water went upward (energy of V.O.W. Concentrate). WonYong Pi(π)-Water which is limitlessly close to the vital water displays excellent effects not only medical field but also in various industrial fields including all the living bodies such as agriculture, livestock, fishery, etc. as well as human being. There are many cases showing effects by practical use of V.O.W. drops utilized at hypertension, diabetes, liver trouble, hepatopathy, nephropathy, inflammatory disease or atopy disease, or cancer which is intractable disease. In addition, it has the effect to suppress pain also. The first feeling sensed after drinking V.O.W. drops for a few days is the fact that the sense of fatigue is remarkably disappeared and the condition of digestive system is getting much better. It is said that the appetite was good in the morning, and the regular and healthy excretion was possible by inhibiting abnormal fermentation in the intestines. ◇ It has excellent effects on protection against aging. 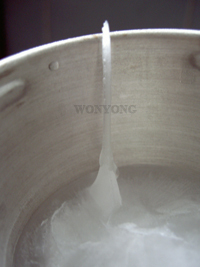 Common use of WonYong Pi(π)-Water can delay the aging caused by weakness and reduction of cell, because WonYong Pi(π)-Water is suppressing oxidation and destruction of cells. 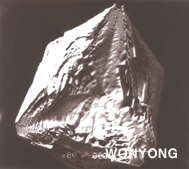 * WonYong Pi(π)-Water and diseases. It is effective for various cancers, atopy dermatitis, chronic hepatitis, nasitis, colitis, pancreatitis, tired eyes, glaucoma, cataract, obesity, insomnia, acute renal failure, pain of joint, muscular pain, bedsore, diseases in digestive organs, allergic diseases, etc. WonYong Pi(π)-Water will affect all the diseases occurred in the human body because it is the water similar to the living body water. There are many cases of splendid improvement from intractable diseases to cold by using WonYong Pi(π)-Water, and it is effective for really various diseases. The efficacy of WonYong Pi(π)-Water acts surprisingly on the serious diseases caused by living habit(diseases of adult people). Hypertension, heart disease, diabetes, liver trouble, hepatopathy, nephropathy, allergic disease, inflammatory diseases(atopy dermatitis, hepatitis, etc. ), cancer, anemia, or very common cold, and other various pains can be suppressed effectively. If cells are restored, it is natural phenomenon for the diseases to be turned favorably. In the aspect of health care treatment, various intractable diseases impossible to be cured by modern medical science are finding their way to be cured gradually. In addition to the portions mentioned in the preceding part, there are many cases stating experiences of miraculous effects by drinking WonYong Pi(π)-Water steadily. Merits of our "V.O.W. Concentrate Technology" are showing excellent effects to improvement of bad health conditions & effective to almost(verious) diseases in whole body by proper multiple actions [It does not work simply(locally) single(fragmentary) action like medicine or the other health products, but proper multiple actions all over body.]. Also, it have no side effects at all(100% SAFETY) differently medicine(side effects), even if you drinks the undiluted solution itself or drinks too much of it, etc, so you can enjoy it any time any place. It makes our whole body activating maximum which all the ability, the living body has. 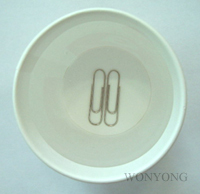 These contents on our website are all about the world's only genuine π-Water, "WonYong π-Water"
just by WONYONG(manufacturer). 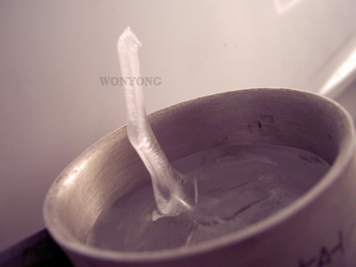 These effects demonstrate only by genuine WonYong π-Water. We have no relation with any other manufacturers of imitation π-water(counterfeits from Japan, USA, etc. ).